The Titan is Nissan's full-size pickup truck, and competes against best-sellers such as the Ford F-150, Chevrolet Silverado 1500 and Ram 1500. The Titan is not as powerful or as fuel-efficient as some rivals, but it does come standard with a stout V8 engine and is available with nifty features for cargo management. Whenever I go over a rocky part of the road I honestly barely even notice it. Some of my problems include tire's not running smooth. Which is a common problem for all SUVs, cars, and truck's. All I had to do was go to my nearest car place for them to fix it. The truck has very soft, durable, and comfy seats. The motor runs very good. When I am on the road, you feel as if you are riding a carpet. That is how smooth it drives and runs. 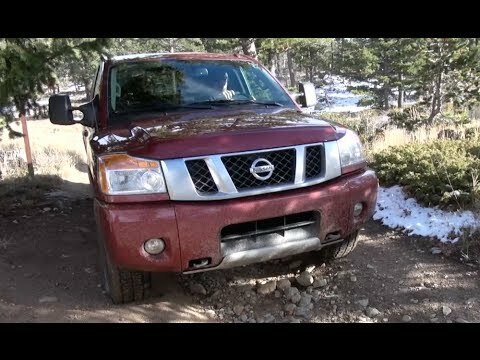 Assessment of my Nissan Titan. This is the second Titan we have owned. Both were purchased new. The first in 2004 and the second in 2014. I love the truck. It is dependable and to date has had no significant issues. I was disappointed in the quality of the newer truck as opposed to the 2004 model. Many things about the truck seemed to be of lesser quality. The king of trucks, Nissan titans take you where you need to go. No major issues, almost 60, 000 miles and nothing major. Keep current with your vehicle maintenance you will be fine. Tons of power with this truck. Drove it 34 hours straight thought without an issue. 4WD will save you. Great leather seats great sound system tons of room for people over 6ft tall. Nissan North America, Inc. (Nissan) is recalling certain 2014 model year Titan King Cab and Crew Cab pick-up trucks manufactured August 27, 2013, through November 13, 2013. In the affected vehicles, the Tire and Loading Information label overstates the maximum load and passenger carrying capacity of the vehicle. Thus, these vehicles fail to comply with Federal Motor Vehicle Safety Standard (FMVSS) number 110, "Tire Selection and Rims for Passenger Cars." If the vehicle is loaded to the capacity stated on the incorrect label, and the tire load capacity is exceeded, the vehicle may experience structural damage to the tire. If this occurs, this may lead to tire failure which could increase the risk of a crash. Nissan will notify owners and will provide owners with a correct label to install, free of charge. The recall is expected to begin on January 21, 2014. Owners may contact Nissan at 1-800-647-7261.